Some folks think native bees can do the pollination job even if honeybees are gone from the environment. But they are not dealing with the fact that an environment that is hazardous to honeybees is likewise hazardous to native bees. Native bees have few human protectors, other than the beekeepers who are trying to protect their own livestock. Fungicides and herbicides generally have little effect on bees, although herbicides can remove weeds that are important food supplies for them. Insecticides are meant to kill insects and bees are insects. 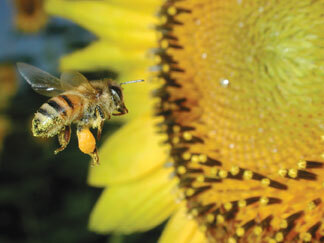 The manner of application of insecticides is the critical factor in preventing loss of these pollinators. Bees are relatively safe when they are at home in their hives or nests. The hazard for bees comes at the points where they are visiting flowers, where they can be poisoned by direct contact or by having their food supply (pollen and nectar) contaminated. Pesticide labels have remarkably good directions to protect pollinators as they visit the flowers. If these directions are obeyed - a legal requirement - bees are safe. But pesticide directions are often ignored. In other words, the loss of pollinators from pesticides is almost always from pesticide misuse, not from pesticide use. Pollinators can be eliminated from the area of an insecticide application, but can recover from unsprayed islands of safety nearby. If the application area is large, such as from a major aerial application for mosquitoes, med-flies or gypsy moths, there are no such unsprayed areas and recovery takes much longer. The impact of the mosquito spraying after Hurricane Hugo in 1989 was a severe loss of wild and domestic pollinators for several years. In the early 1990s there were farmers with fields from which they never picked a single watermelon or squash, because the plants didn't get pollinated. Pollinators know no boundaries. Your garden's pollination can be greatly affected by your neighbor who thinks the only good bug is a dead one and proceeds to fog his property several times a season, or by the aerial applicator for mosquitoes or nearby cotton, if they don't obey the bee directions on the labels. Dave Green was a commercial beekeeper who specialized in crop pollination service for growers of watermelons, cukes, squash, cantaloupes, strawberries, peaches and apples. He sold his business and retired a few years ago. After awhile he took up a second career as editor of a small-town weekly newspaper. Enjoy the best of the Palmetto State's great outdoors! Subscribe to the SC Wildlife Magazine!